A couple of weeks ago I gave a presentation about iPhone development at Gamelab, the main game development conference in Spain (yes, it was my first technical presentation in Spanish!). Afterwards I was interviewed by Zoom Net, a popular TV show about games and technology. 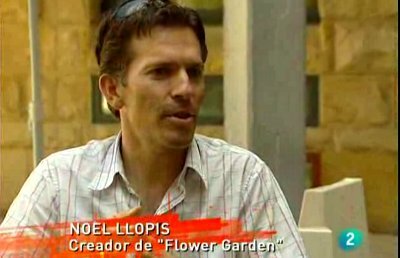 Yesterday they aired the episode with my interview and I was pleasantly surprised to see they turned it into a full 4-minute section covering Flower Garden. Coverage starts at 8m 40s from the start (and, obviously, it’s in Spanish). For some reason that seems really weird to me to hear you speaking Spanish! It’s almost like it’s been dubbed or something. Wow, that’s a very fluent Spanish. Had no idea. Are your parents native speakers? Congrats Noel, I’m glad to see you getting some good exposure, you deserve it! Keep up the great work!